This blog article is being presented as a public service to anyone who is still using Windows XP on their computer. If you are one of those persons (and there are many) please do your self a favor and read the rest of this article. Windows XP will soon be obsolete. This is too bad because arguably windows XP was one of the best operating systems ever developed by Microsoft. Released in 2001, this operating system was user-friendly and compatible with older versions of software. 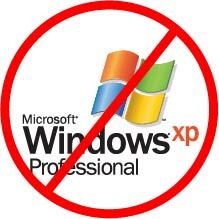 However, on April 8th, 2014 Microsoft will discontinue support of Windows XP. This means that if you continue to use a computer with Windows XP after that date you will be highly vulnerable to virus and other malicious software that can attack your computer and destroy valuable data you have been collecting for years. That is the bad news. Read on to find out what you can do about it. Purchasing a new computer is probably the most painless of all. The only issue that has to be worked through is transferring your files, such as documents, spreadsheets, pictures, etc., from the old to the new. There are a number of ways to do this, and describing each would be a blog article unto itself. You can download and run a program to determine if your existing computer is capable of running Windows 7 or Windows 8.1. This option will get you off Windows XP but you have to remember you will be installing a new operating system on old hardware, and the older the hardware, the more likely it is that components will start to fail. This option would be my last choice, but if your budget is constrained, this may be your only option. Linux is a good choice for old hardware. It typically will run well on less processing power and less ram than is required for windows. Additionally, it comes pre-populated with a full suite of software, and it is free. I am a huge fan of Linux and have used it for years, but it does require some IT knowledge and skills to install and properly configure. If you cannot afford to purchase a new version of windows, or a new computer, this is a good way to go. Moving out of the windows world and moving into an Apple operating system, such as a MAC is a good choice. However, there is a learning curve to contend with and the range of software available is less than what is available for Windows or Linux. If you are the type of user who requires a word processor, a web browser, and a good email program, then a Mac would serve you well. The question has been asked, “What happens if I do nothing?” It is unknown for sure, but I can guess it will not be good. It is possible, but not likely, that Windows XP will continue to function as it does today, with no problem, for years to come. I believe there are already known vulnerabilities in Windows XP that have not been exploited. I believe that shortly after Microsoft quits providing security patches the virus writers will exploit these vulnerabilities. If that happens, all that you have on your computer is at risk. If you use a computer not connected to a network, then all will be fine. But if you are on the internet, you will be at risk and it is only a matter of time. I would not recommend this, and for the sake of those who share emails, files, or pictures with others, please consider one of the upgrade paths listed above. I hope this information is of value to some. If there is any interest, I will be happy to write more extensively on some of the options listed above. Let me know what you would like to se. Feel free to comments, like, and share this article. I lost my last computer running XP a few months ago (power supply); but still recognize this as a great warning for folks. Switching data from old computers to new is getting a lot easier. I brought data from a Dell laptop to an HP laptop using an HP utility that was almost seamless. I agree with your view of XP. Best ever from MS.